Submitted by steev on 8. November 2007 - 8:29. The sun is rising in Calexico and I can't sleep. It's my third morning here and every morning I wake up shortly before sunrise, on the floor of a bedroom of a house that we've turned into an independent media center. Every morning I can't sleep too much later than this, despite the fact that I'm sick, have been fighting a cold for the last 3 weeks or so. Sin embargo, nevertheless, I am happy. Even excited (maybe this is the real reason I can't sleep) - because the camp was successfully occupied yesterday. Like it's looked and felt for months, it was extremely uncertain and worrying for quite a while yesterday, with massive presence of various law enforcement agencies. But somehow, things went off relatively according to plan. 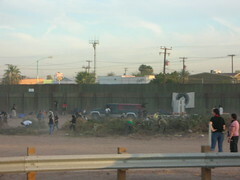 Homeland Security and the cops were completely fooled by the ruse the organizers set up - to pretend to be going to a pick-up point where marchers would get on a bus to take them to a cemetary vigil, but actually, the pick-up point was the site for the camp. Some cops were even overheard to say, basically, "I don't know what they're doing, their bus just left." Amazingly enough, there's even internet at the camp. A 45-foot tower with a wireless internet antenna is sitting in the backyard of the media house and beaming our connection 3 miles out into the desert to another tower that the campers have set up. Also, there were people getting in and out, bringing in water and food and supplies, for quite a few hours into the night, even with cars, although no one is sure if this will last and some reports were that the police later tightened things up so that people could get out but not in. I was shooting some out there but for the end of the day found myself back in the media center uploading photos and doing radio. There are 2 streams, one from here and one from the Mexicali side, and the possibliity of another that will be the broadcast FM signal from the camp, if that gets set up. And there's radio, photos, and more photos, and text and video about it.